U-Maki Sushi Burrito is coming to Vintage Marketplace on Louetta Road. It will open in the second quarter of the year. 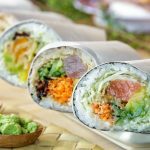 The restaurant will allow customers to pick sushi fillings such as fish, rice and vegetables, which is served in a burrito-style wrap. Click here to read the full article on Community Impact Newspaper.